WS SysConfig™ is the interactive, web-browser-oriented application mechanism used to define and configure WebSCADA application systems. As a comprehensive configuration tool, WS SysConfig enables WebSCADA users to design the structure of the automation systems for their operational needs. WebSCADA systems can be designed to have five configuration layers (System, Channel, Device, Block, and Point), and WS SysConfig provides users with everything needed to configure each layer of the WebSCADA architect topology in a structured hierarchy. SysConfig offers two configuration options--web browser and XML file. 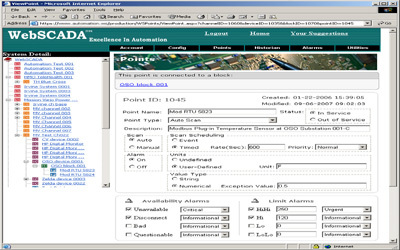 XML file may be a preferable format when working with a large WebSCADA system whose configuration exists in other forms (e.g. a spreadsheet application or database table), while web browser makes it easy to configure items in a graphic interface that allows users to configure the entire WebSCADA system through a familiar web interfaces.